February 2019: For our new feature documentary ‘Sea of Shadows’, directed by Richard Ladkani (The Ivory Game), produced by Terra Mater Factual Studios in association with Appian Way, Malaika Pictures and The Wild Lens Collective, it was a successful festival from the early beginning: Each of the 8 screenings ended with standing ovations, the theaters were sold out, public and media were impressed by the film and aroused by the topic. 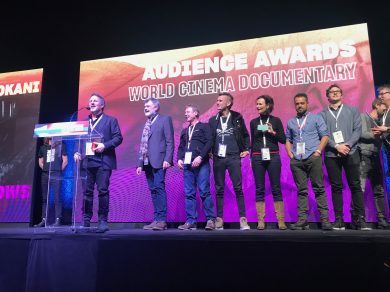 On Saturday, the success of ‘Sea of Shadows’ was crowned with the Audience Award in the World Cinema Documentary Competition and some hours before with the prosperous acquisition by National Geographic Documentary Films. (L-R) Richard Ladkani, Walter Kohler, Wolfgang Knopfler, , Jack Hutton, Anita Ladkani, Andrea Crosta at the Award Ceremony during the 2019 Sundance Film Festival on February 2, 2019 in Park City, Utah. Called “heroic and heartrending” and “a stirring adventure” by The Hollywood Reporter after its Sundance premiere, ‘Sea of Shadows’ is a tense documentary thriller that spotlights a rescue mission to save a collapsing ecosystem and with it, the vaquita – the most endangered and elusive whale on Earth. In the Sea of Cortez, a war is being waged by Mexican drug cartels and Chinese traffickers. A native species of fish, the totoaba, is being poached at an alarming rate because of a superstitious belief in China that their bladders — more expensive per ounce than gold — possess miraculous healing powers. Nicknamed the “cocaine of the sea,” these extremely rare fish have triggered a multimillion-dollar black market that threatens not only their existence, but virtually all marine life in the region – including the endangered whale known as the vaquita. ‘Sea of Shadows’ goes inside the fight for survival as a team of brilliant scientists, high-tech conservationists, investigative journalists, undercover agents and the Mexican Navy put their lives on the line to save the last remaining vaquita and bring the vicious international crime syndicate to justice.